Despite the shooting day for the horse stunts in Tech Hunt being rescheduled I decided to head up north. Primarily this is because my train ticket was non-refundable, but also to partake in production meetings, seeing good friends, and to perform a few test shots with my Graflex camera. I’m not sure what was tested more, me or the camera! I’m prone to diving into the deep end of things, it’s the fastest way to learn! 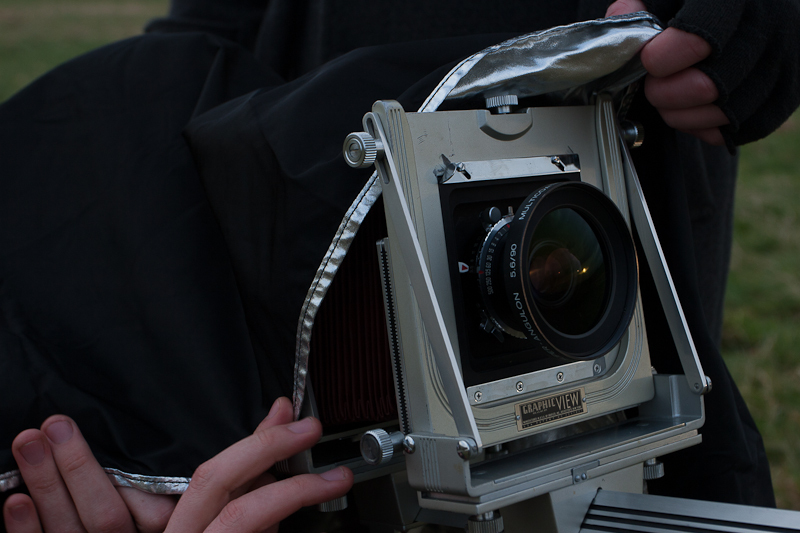 I’ve done a few test shots with the Graflex before, however I wouldn’t describe myself as wholly confident with it yet. If you’ve seen the footage taken of me loading the film into the holders I probably look like I’m being in to forced running across the M4 with a blindfold on. I’ve taken portraits and I’ve taken environmental photographs before with it, but I’ve not yet mixed the two, and I’ve definitely not yet shot a horse with this camera. So the first shot I decided to try? Only a photo with the horse running by at quite close proximity! Me looking like I know what I’m doing. One thing that’s really hard to gauge without actually being there is just how close I need to be to the horse to make it fill the frame. A 90mm lens on a DSLR (full frame or cropped) is fairly zoomed in, good for headshots. 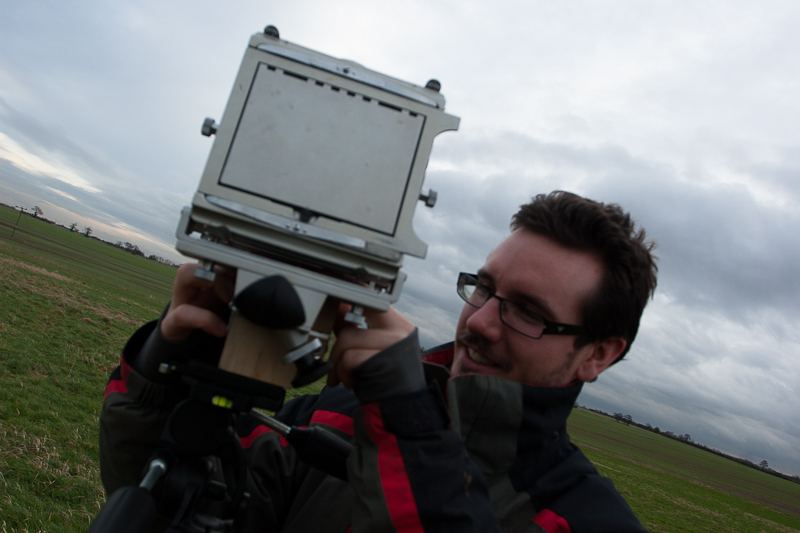 However 90mm on my Graflex is more akin to a 20mm lens on a full frame camera, really damn wide! This causes issues because the closer I am to the horse, the shallower the focus is. 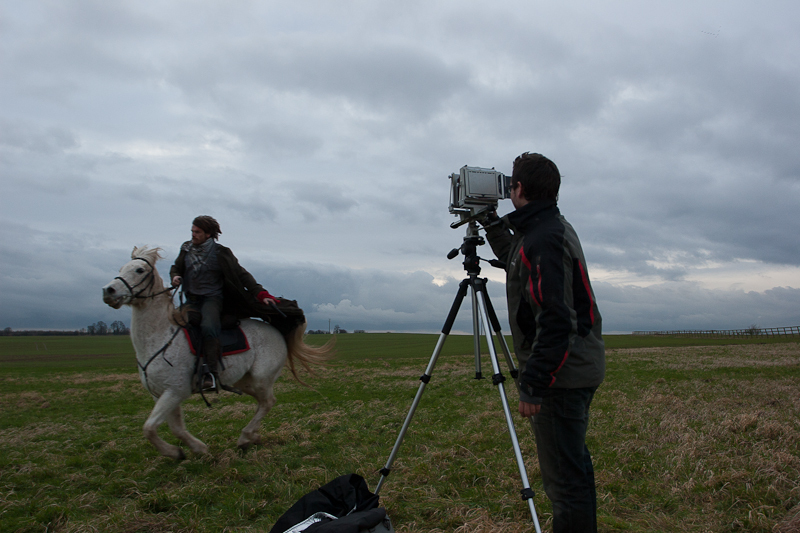 Also, the closer I am to the horse, the more it’s movements are exaggerated, motion blur also becomes a larger issue. Focusing is hard when it has to be done on a screen that looks like this. So the first shot was a good way of getting an understanding of my limitations in regards to movement on a fairly cloudy afternoon. One of the things I found I need to work on was controlling the pace that I work at. Typically on set with a DSLR I don’t think twice about taking a photo of opportunity. The costs are completely negligible if the photo looks bad. With the Graflex however, Each photo costs £6 in film and development alone, and each photo can easily take 20 minutes to set up and perfect. So when we were all ready, and Chris Cronin was actioning the horse and it’s rider to run past the camera, I had to be completely confident in my timing. One of the fun things with the Graflex is that once focus is locked and you’re ready to take a picture, the film holder completely blocks the viewfinder. If there’s movement in the subject at this point, how it will come out is essentially guesswork. You can mitigate randomness somewhat by planning and repeating movements, just as a film crew would do normally. What was tricky for me, was the fact that I was no longer looking through the perspective of the camera, I was separate from it, so my brain just didn’t engage properly. 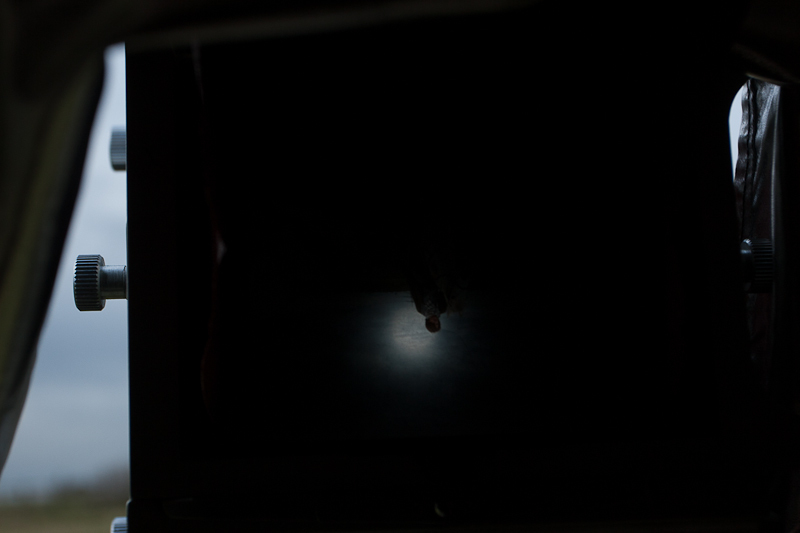 I think I hit the shutter just a tiny bit late. 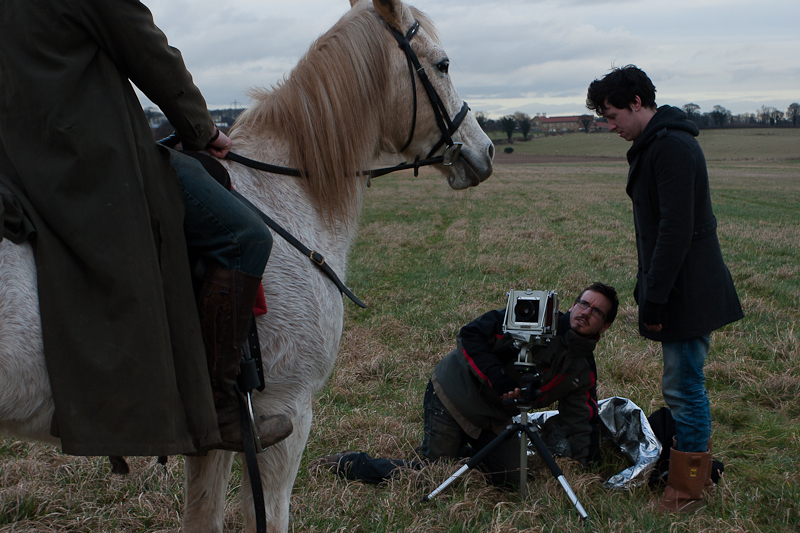 I think the horse is still in shot, However I doubt he’ll be centre of frame. So I’ll probably lose a bit of clarity if that is the case. Lesson Learned. I also did similar thing for the third photo. That time I decided a still portrait of the horse and rider would be most suitable. Focusing was done, we had a happy, still horse (phew), and I was just waiting for the horses head to stop moving about in a position that was camera friendly. Snap – I took the picture. Little known photographer fact: When a photographer’s camera is out of focus, you can tell by the look of stern concentration on their faces. Once again the differences between standard stills and LF stills had a fight in my head. Normally stills shots of actors are taken as and when, and if a photo looks suitable, it’s taken. Occasionally I’ll get the opportunity to direct an actor, however it’s very much a nice bonus rather than an expectation. Here, I was boss, and had total control, however my stubborn old brain hadn’t realised this, so when Mike, our model / actor was within my boundaries of “Yeah, that’ll do” I instinctively just shot without thinking. When in reality I should have waited for everything to be constructed and polished to a sheen before leaping at the chance. The silhouette will be a good critical test of my focusing skills. The fourth shot was much less dramatic for me. 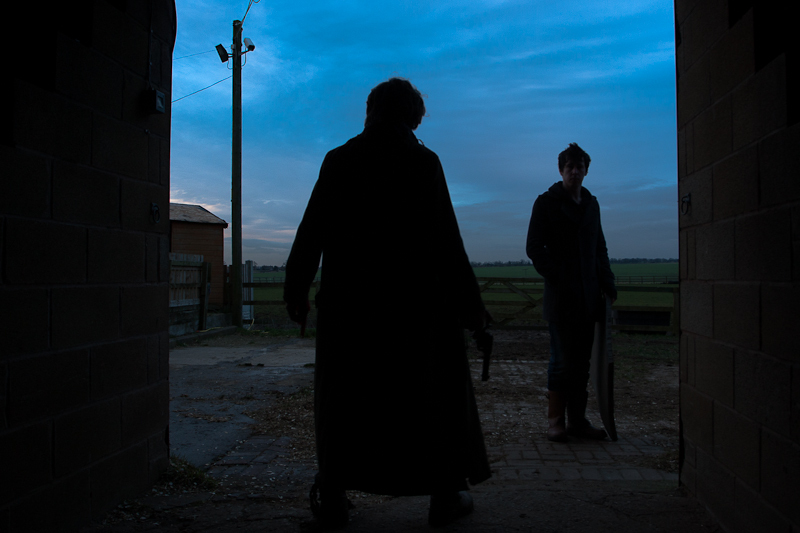 It was a test for me to understand the latitude of the film I’m using; a silhouette with some bounced light for the nearby environment and side lighting of the subject. By this point I was already becoming a little more comfortable with what I was doing. There were a few focusing issues which annoyed me, and sitting on a barn floor after quite a long day means that I was being a little lazy. I’ll probably end up nit-picking the image to death when I see the final result. So now, I’m on the train back to London. When I get back home I’ll organise my life out a little bit and hopefully have the time to dash off to the labs and get these four images developed. Once I see the quality of these I’ll then be deciding where I’ll be having the negatives scanned. Was the trip worthwhile? Definitely. Having performed an actual test shoot out in the field with a horse has made me much more comfortable with what I’m doing, and I’m glad I came across a few hitches along the way; This means I’m just that much more prepared should things get a little bit hairy on the actual day, which will surely happen! This entry was posted on February 9, 2013 by marchankins. It was filed under Photography and was tagged with Film, Graflex, Large Format Photography, Marc Hankins, Movies, Photography, Stills, Tech Hunt.